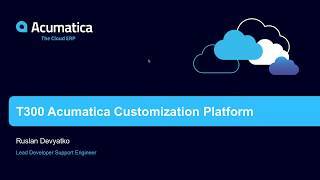 The Acumatica Customization Platform course is intended for application developers who start learning how to customize Acumatica ERP or other Acumatica Framework-based applications. It is required from you to previously work through the lessons of the T100 Introduction to Acumatica Framework and the T200 Acumatica Framework Fundamentals courses. The course is intended for application developers who are starting to learn how to customize Acumatica ERP or other Acumatica Framework-based applications. 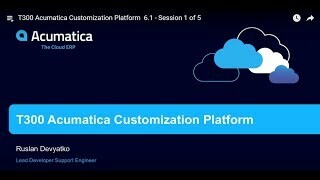 It is based on an end-to-end customization task that demonstrates the general approach to customizing Acumatica ERP. The training guide is now actual for Acumatica ERP 2017 R2. Step 11.1: Using the New Screen Wizard to Create a Form Template (in Part 6) shows how to include in the customization project the information about the position of a new form in the modern UI.